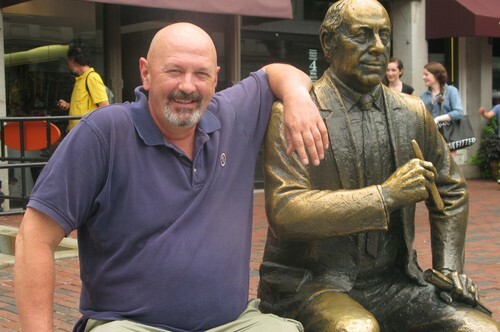 Journalist Roger Carroll is pictured with statue of Red Auerbach in Boston. Award-winning journalist Roger Carroll recently resigned as The Telegraph of Nashua’s executive managing editor after being told to remove facts from a story about the newspaper’s return to downtown Nashua after 30 years in Hudson, according to Nashua This Morning talk show host George Russell on WSMN AM 1590. Russell said during the show that Carroll was told after the print newspaper was published September 9 to remove from the online edition the assessed value of the new downtown building, the price that was paid and any reference to being owned by Ogden Newspapers Inc., a West Virginia-based media company that owns more than 40 newspapers across the country. Russell made the comments during a weekly Thursday morning news segment with InDepthNH.org reporter and founder Nancy West. Carroll later confirmed that he gave his notice as a result of the directive. “I thought this kind of censorship showed a staggering disrespect to the role of the newsroom and to the Telegraph’s readers,” Carroll said. Jim Konig, publisher of the Telegraph, declined comment when reached by phone. “It’s our policy that we don’t discuss any employee issue publicly,” Konig said. The two versions of the Telegraph story are clearly different when comparing the e-edition of the printed to the online version of the story. Both versions said the Telegraph had recently purchased a downtown city block at 106 to 130 Main St., that the newspaper would move into a space at 110 Main St. and said it will sell its current 80,000-square-foot facility in Hudson. The printed version quoted public records at the Hillsborough County Registry of Deeds, saying the Telegraph purchased the building from an entity called CREG106-130 Main St. LLC for $650,000, and said it had an assessed value of $1.8 million. The printed version said the newspaper is owned by Ogden Newspapers Inc., a West Virginia-based media company that owns more than 40 newspapers across the country. The price paid and assessed value of the Nashua building and Ogden Newspapers’ ownership were missing from the online edition. Robert Nutting is the CEO of Ogden Newspapers. He also owns the Pittsburgh Pirates. Ogden Newspapers Inc. bought the Telegraph in April of 2013 and cut one-third of its staff by the following year when it closed its statehouse bureau and laid off well-known political reporter Kevin Landrigan, according to an article in the New Hampshire Business Review. According to the Telegraph’s website, Carroll’s 30-year career started as an award-winning radio reporter in Lebanon, then as a staff writer for the West Lebanon Valley News, and then as the editor of the Eagle Times in Claremont. “He also authored a critically acclaimed history of Lebanon, worked as a congressional aide in Washington and a staffer for the New Hampshire House of Representatives, and spent a season as an assistant coach with the Dartmouth College men’s basketball team,” the website biography said.